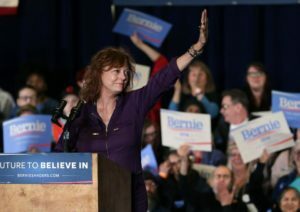 “I believe in a way she is more dangerous,” Sarandon suggested in an interview with The Young Turks after being asked why Clinton’s foreign policy went largely unchallenged during the Democratic primary. “So I’m curious to see if anyone brings up these things. But this is what we’re fed. ‘He’s so dangerous. He’s so dangerous,’ ” Sarandon said. “Well, there has been no indictment,” Jansing said.